Blogging on the go can be extremely useful if you're only a part time blogger like me. Having the ability to upload photos straight to blogger/wordpress for later, or just to jot down some spur of the moment ideas; apps can be super useful. They can also monitor page views, followers, schedule tweets and posts and even edit photos on the go. Who needs a laptop?! Whether you do it straight from your phone or on a tablet, they can really help you and are great to have, even if you only use them once or twice. Technology has advanced so much in the past few years, making people more and more reliant on their mobiles and making even more possible from the palm of their hand. 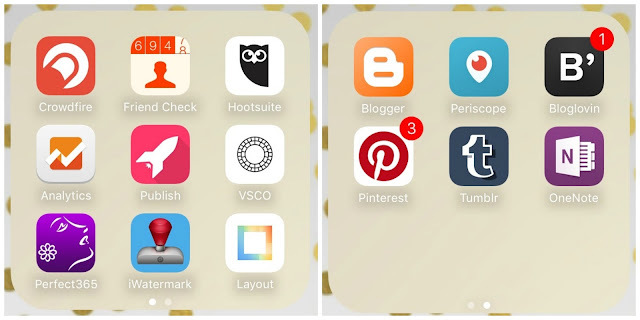 Here's the low-down on our favourite/most used blogging apps on iPhones/iPads. Most of the apps are also available on Android. The first app of our favourites is Crowdfire. This is fabulous for monitoring followers.. both gained and lost, loyal 'fans' and inactive users. You can see who's recently unfollowed you, blacklist people etc. You can connect both your Twitter and your Instagram. The second app has become quite useful in recent weeks as it allows us to keep track of our follower numbers, check whether people are following us, compare our stats with others etc. Friend Check is a must have. Although, you do also have similar functions on Crowdfire. Again, this works for both Twitter and Instagram. The third, and probably one of the best apps to use is Hootsuite. This app is used by many bloggers to monitor feeds, schedule tweets and track hashtags; great if you follow twitter chats. You can connect this to pretty much all of your social media accounts, which makes it one of the most useful apps in our use. Google Analytics is another useful app to have. This gives the most in-depth analytics of your blog, telling you how many views, the conversion rate, viewer demographics, acquisition and even live stats. This info is a lot more accurate than that on blogger, but only tracks from the moment the tracking code was applied to the blog, rather than from the moment the blog was created. It's certainly one to use. Publish is another app we use to schedule our posts. This app however, allows you to schedule Instagram posts, which as far as I've found, is the only one that is able to do this. Want to post to more than one account? No problem! VSCO is one of our absolute favourites for photo editing. It's many filters and plentiful adjustment tools make the most stunning images. We use this app for both Instagram posts, blog photos and for Tumblr and Pinterest too. It makes photos super pretty and can turn even the worst lit photo into a bright, white work of art. Perfect365 is an app which I found out about from the Kardashians! An app that can make your imperfections and dark circles disappear with the swipe of a finger. This app essentially is an airbrush that can photoshop your face into looking its most gorgeous self. iWatermark is needed more than ever these days with illegal use of photography online, breaching copyright etc. This app allows you to watermark your images to ensure people cannot re-use your images without your permission. With a wide range of colours and fonts, you can keep your photos safe and secure. Layout is an Instagram extension which allows you to place images in a grid, combine photos and create collages. It can be very useful to bloggers when posting about events, giveaways, hauls or just things they've done that day. Not one we use often, but it's always useful to have it! Blogger is our host site of choice so having the app on our phones can be extremely useful on the go. We can upload photos from our phone without having to back up to our laptops, create posts when inspiration strikes and ensure that scheduled posts have gone live. Having your host site in a handy app really is invaluable, if you're able to do this with yours, it will be so useful. I've come so reliant on Periscope for my daily British Beauty Blogger fix and live broadcasting of events I've been to. More and more bloggers are using this app and I can't recommend it enough! I get to watch product reviews live and if i miss it, I can easily catch up within 24 hours of their stream. Bloglovin' has fast become THE go to site to get all your favourite blogs in one place. 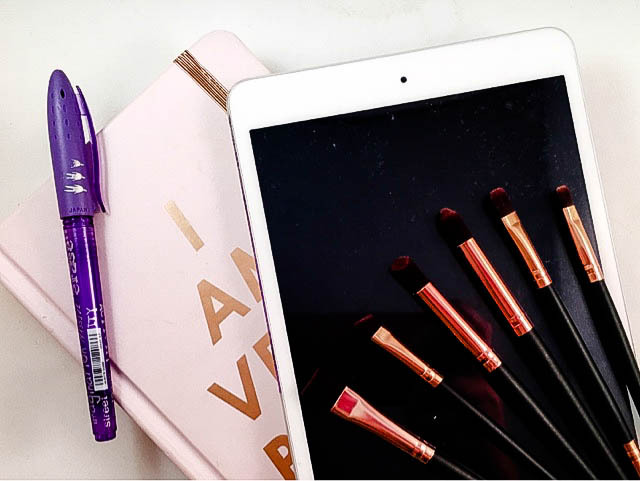 To keep track of new posts, discover new blogs and track who follows you, Bloglovin' is super useful, especially on the go. Scrolling through my newsfeed, as I would with Twitter, it makes my journeys to work so much more interesting! Pinterest and Tumblr are other social networks we use to discover things. Pinterest is my favourite for coming up with ideas, inspiration and blogging tips. Tumblr is my go to app for funny or pretty pictures, not used that much, but it's great to have it! 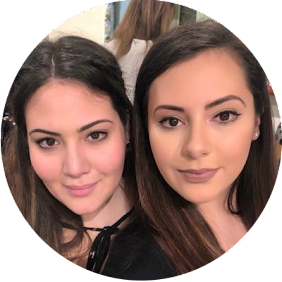 OneNote is a Microsoft Office app that keeps all my ideas in one place, whether it be pictures, tables or blog post ideas, it allows me and Kirsty to share our ideas seamlessly across all our devices! Other must-have apps include Twitter, Instagram, Facebook, Linkedin and Google Photos. Google Photos especially helps us in storing the huge amount of photos we take on a day to day basis. This unlimited amount of storage means there's no limit to how many times we back up and means we can share images across devices easily and frees up space from our phone storage! Buffer's a great one to use too! There are so many scheduling apps out there! That's why I schedule my blog posts to go out at 10am, so I'm already at work and can keep an eye on twitter etc to make sure they are automatically shared!